Julie Davis and Nikki Buckelew discuss options for a potential client. Photo courtesy OKC Mature Moves. Just as it takes a village to raise a child, it takes a village to care for our elders. For retirees, the thought of making decisions about downsizing or moving, where to move, and how to plan for future lifestyle needs can be overwhelming. Recognizing the need to make late-life transitions easier, a group of senior living communities has partnered with Chris and Nikki Buckelew of OKC Mature Moves with Keller Williams Realty Platinum. “The most recent evidence of how our partnership is making a difference is the impact that we made for a couple who had no family, no extended family or even neighbors to help them with the important decision of transitioning to the next level of their life,” said Julie Davis, marketing director at Concordia Life Care Community in north Oklahoma City. That’s a reality for many late-life movers, she said. Even deciding where to start can be overwhelming. Davis called OKC Mature Moves, a local company that helps seniors relocate and sell their homes. Many seniors know that they want or need to make a move into a senior community like independent or assisted living, but don’t know where to begin. The couple, now at Concordia, ages 87 and 91, was struggling with maintaining their home. They also had some physical challenges which made living alone difficult, especially when it came to preparing meals, driving and personal care, said Nikki Buckelew, founder and lead listing agent at OKC Mature Moves. “Mr. Weeks said to me during our first visit, ‘I know we need to move to Concordia where we can get more help, but I don’t know how we can possibly do it ourselves. We have no children and no relatives to help us and physically we just aren’t able,’” she said. “Julie Davis knew that it would take a team effort. Together, we were able to help the Weeks get moved and settled at Concordia,” Buckelew said. Many older adults want to move to a community where they feel a sense of security. “Unfortunately, sometimes the only thing holding them back is the inability to execute the move. It can be a daunting task for seniors when they are already physically challenged or feeling vulnerable,” she said. Senior living communities are focused on providing a great lifestyle experience for seniors but can’t facilitate the entire move. “Our partnerships with senior living communities is simply to ensure that older adults who need or want to relocate can do so without the stress and angst that moving can cause,” Buckelew said. Mature Moves is filling a need in the real estate world. It involves knowing how to address the sensitive issues sometimes involved in late-life moves, as well as effectively and professionally managing the tasks involved in a project like relocating and selling a home. The Mature Moves team with a focus group at Concordia Life Care Community learning how they can help seniors most effectively. Photo provided. “In the case of Mr. and Mrs. Weeks, someone needed to serve as the project manager so the couple would not be taken advantage of,” Buckelew said. The Weeks are now settled into their new apartment and the Buckelews are handling their home sale and estate liquidation. “The couple is grateful and felt the burden had been lifted off their shoulders. They are content and at peace,” Davis added. Because of stories like this the group of senior living communities, which includes Concordia, Lionwood, Grand Tapestry, Fountains at Canterbury, Brookdale, the Veraden, Hefner and Southwest Mansions, and Southern Plaza, is expanding its collaboration with the real estate team. More are expected to formalize their partnerships. In addition to supporting each other, OKC Mature Moves has recently begun featuring local, age-restricted lease communities in its multiple listing service and has recently rolled out an exclusive VIP program for these invested communities and their residents. At a recent luncheon, Buckelew addressed a group of senior living executive directors and marketing managers. Consider healthcare in comparison. “If you have chest pains, you don’t call your dermatologist,” Buckelew said. Similarly, she believes seniors and senior living communities need to choose the most appropriate real estate specialist to deal with late-life relocations. “Partnering with those who understand and specialize in serving the unique needs of seniors and who can make relocation less stressful just makes sense,” says Buckelew. Paquette adds that being able to offer seniors these options takes away the anxiety that is often involved in these decisions. Making sure that new residents feel supported and respected in the process is paramount. Likewise, many senior communities offer services that are addressing the needs of their residents through collaborative efforts, making seniors feel more confident knowing they have a whole team on their side. Buckelew said expanding a partnership such as this is simply a natural progression of her company’s philosophy, which has always included close community ties. 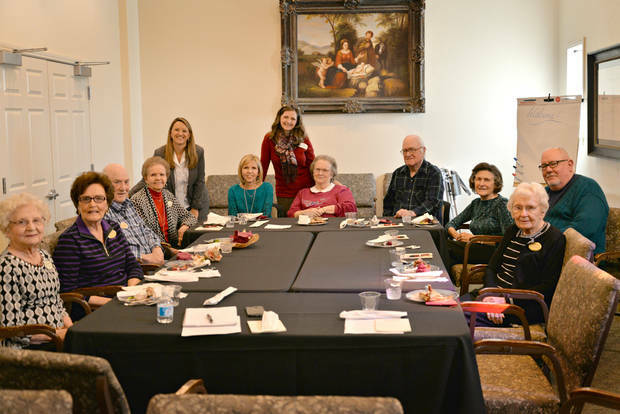 Buckelew also heads up collaborations such as Legacy Leaders Serving Seniors, a grassroots professional networking group for those whose primary client base and professional focus is centered on serving older adults and their families. 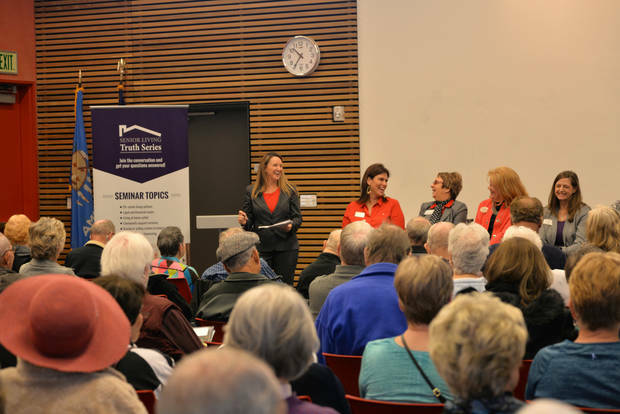 Nikki Buckelew and a panel of senior living experts at the Senior Living Truth Service, another Mature Moves project. Photo provided. As real estate agents specializing in the mature market, Mature Moves solves complex problems often involving sensitive issues. “For us it’s more than real estate, it’s about life and it’s about giving back to our elders. They cared for us as we grew up and it is our responsibility to be there for them when they need us,” Buckelew said.